Ciara Mageean and Ben Reynolds both produced impressive performances to clinch gold medals at the Irish Indoor Championships in Athlone on Sunday. Mageean, 23, improved her 800m indoors personal best by 1.14 seconds as she won the title in an impressive 2:03.76. 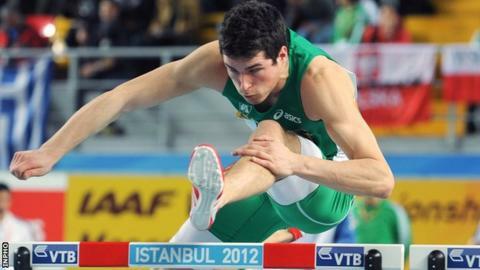 Reynolds, 25, was 0.01 seconds outside the World Indoor Championship standard as he set a new 60m hurdles personal best of 7.73 seconds. The North Down athlete's time cut 0.01 off his existing personal best. Reynolds plans to chase the world indoor standard again in the Czech Republic next weekend. "I'm really pleased with that. It's my first time this season at full speed over the hurdles," said Reynolds. Mageean led from the gun in the women's 800m final as she won from Laura Crowe (2:05.28) and City of Lisburn's Erin McIlveen (2:05.83). McIlveen's club-mate Kelly Neely was fourth in 2:06.13 but Commonwealth Games semi-finalist Katie Kirk could only manage sixth in 2:09.82. "It's been a good indoor season and hopefully a good indicator for the outdoor season ahead," said Mageean, who has set two national indoor records over 1500m and the mile. She has the world indoor 1500m standard but won't compete at the championships. After his 1:48.15 heat win on Saturday, Letterkenny star Mark English eased to the 800m title in 1:51.57. English has not achieved the qualifying standard for the world indoors but is still hoping to get the nod from the Irish selectors. "When you're in good form I don't see why you wouldn't go to a championship," said the UCD medical student. Newcastle athlete Kerry O'Flaherty made a brave effort to complete a middle distance double in Athlone but had to settle for second place in the 1500m final after her 3,000m triumph on Saturday. O'Flaherty hit the front just after halfway but was chased down by Claire Tarplee who took victory in 4:23.21. Steeplechase specialist O'Flaherty held on for second place in 4:24.39 with Amy O'Donoghue (4:27.58) in third spot. South Derry man Adam McMullen continued his consistent indoor campaign by winning the long jump in 7.73m while Carlow youngster Marcus Lawler produced one of the performances of the weekend as he won the 200m title in 20.96 seconds. Ballymena & Antrim's Christine McMahon was unable to retain her 400m title as 54.77 seconds left her behind Sinead Denny (53.57) and Jenna Bromell (54.30). North Down's Andrew Mellon (47.59) produced a brave bid to win the 400m title but was pipped by Richard Morrissey (47.51). With Amy Foster an absentee from the championships, Phil Healy won the women's 60m title in 7.47 seconds and also triumphed in the 200m.